Also be sure to read this other post for a comprehensive explanation of how the Earth’s Past and Present Global Temperatures Clearly Follow Known Patterns. DON’T MISS IT for a full understanding of the proven science. We are quickly entering a period of deadly cold on Planet Earth. NASA’s own Sunspot Tracking page makes specific note of the similarity between today’s declining Sunspot activity and a similar event the lasted from the year 1645 to the year 1715 called the “Maunder Minimum”. This period in history is known for cold weather that made growing food difficult or impossible in Europe and North America. Disease and Famine and resulting Wars racked the planet. Theodor Landscheidt was first to correlate these times with Solar Sunspot activity and El Nino/La Nina events to accurately predict temperatures in the Northern Half of the Earth. Carl Smith and Geoff Sharp found the influence of the large planets Jupiter, Saturn, Neptune, and Uranus on the Sun. The gravity of these huge planets tug on the sun, influencing the Sunspot cycles. The Solar activity cycles control the Cosmic Rays that govern cloud cover on Earth. Henrik Svensmark demonstrated the clear Corrolation that increased Cosmic Rays increase Cloud Formation. Cloud formation releases vast amounts of Warm Water Vapor heat into space, and the tops of clouds reflect 90% of the Sun’s Heating Radiation. Water Vapor is 95% of the Earth’s Greenhouse Gasses. Together, Landscheidt, and Smith, Sharp and Svensmark predict we are entering into a mini ice age similar to the Maunder Minimum, that could last 30 years or more. Direct Evidence for this cooling has been provided by Calibrated Satellite temperature measurements of the entire Earth, something that NASA’s thermometers on the surface cannot do. These satellite temperature measurements show a slight cooling that began in 2003, not the warming that NASA/NOAA claims from surface thermometers they adjust to make warming appear. If the Landscheidt predictions are correct, we are tipping into a period of deadly cooling, not uncomfortable warming as predicted by the IPCC International Panel on Climate Change at the United Nations. The IPCC are not scientists. They are Politicians who pay scientists. They are getting what they pay for. They are getting more predictions of Global Warming, when it is not warming. As the real trend of cooling continues, we will need all the energy sources we can find to compensate, including renewables and non-renewables. Politics and science have teamed up in the past to predict future cold and warm periods. They have always been wrong because the scientific mechanism was not fully understood. This includes the current “Global Warming” or “Climate Change” predictions. Look back at them and see how many of their predictions have come true. NONE of them have come true. Decide then for yourself who to believe. Now we finally have a scientific explanation for these warm and cool periods, and it does not seem to follow the amount of CO2 in the atmosphere. Instead, CO2 FOLLOWS the temperature changes with a delay of hundreds of years. Today’s Global Warming theory has them backwards. Al Gore conveniently shifted the long term graphs to make it look the other way. Check it. 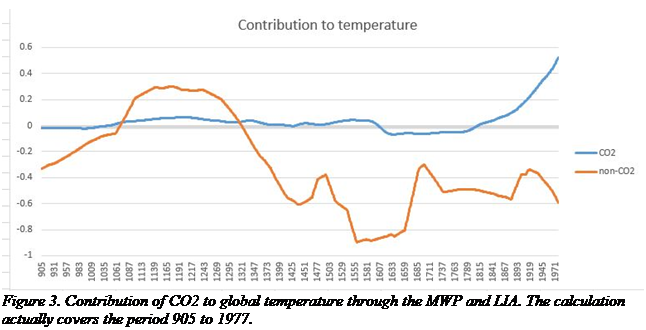 The only time in recent history when warming followed CO2 was a coincidence from 1974 to 2003. That was very convenient for Al Gore, a politician, not a scientist. Before that (1950s and 1960s), and after that (2004 to now), temperatures went down while CO2 went up. NASA/NOAA PUBLISHED Thermometer Records are wrong from 2003 to now, they are too hot. NASA/NOAA adjusted their RECENT measured temperatures upward, and adjusted their own previously published PAST measured temperatures downward, showing a warming trend. They did this, by adjusting their own raw surface measurements that were already verified by the very close Satellite temperature measurements. Why do they make these adjustments when their own raw data is confirmed by the satellites? Ask them, that is what they get paid for. NASA/NOAA also went back in time to adjust the past Thermometer records to make the past cooler than today. Therefore, they continue to make claims of “The Hottest Year” each year. There are other posts here on this site from other sources that clearly show this is true, including a simple presentation to Vladimir Putin from his scientists in 2004 making it very clear. It also makes it very clear that the cost of trying to change the weather is infinite if you choose CO2 as the control knob. It does not work. This disconnect between CO2 and Global Temperatures was clearly and in detail understood as far back as the original Kyoto Protocol meeting on Climate Change in 1992, but its conclusions were against the grain of the popular Global Warming Theory then and now. The potential economic damage of pursuing CO2 reduction was also clearly understood. Here is a link to the Putin presentation that was prepared for him, not for public presentation. It was shown there once, but not well attended. Be sure to see the second half, where graphic proof of the science shows CO2 does not track with temperatures, and the Global Warming theory is flawed. The sunspots are directly correlated with temperature cycles on the Earth. NASA themselves observed that this is true in the quote below. The mechanism is not that the sun gets brighter or dimmer, but instead, the active sun blocks cosmic rays that make clouds. How in the Universe can CO2 control Climate? We are being prepared for the opposite temperature trend than is truly happening for political and financial gain. We will know for sure in the next few years, but the signs are already here. Polar Ice caps are back to normal and growing. Greenland is not melting. The Northwest Passage is closed. Record Cold weather events are at least as frequent than Record Warm weather events. NASA has since become attached to the Political Bandwagon of Global Warming supposedly caused by CO2, caused by Humans. The science for this could not be more incorrect. NASA abandoned their statement above, their understanding of the relationship between the sun’s activity and Earthly temperatures because they did not understand how it works. They observed that the sun’s brightness only varies slightly, perhaps 3%. Because of the attraction towards blaming Humans for “Climate Change”, they abandoned the clear relationship between sunspots and Earth’s Temperature. Instead, they attached themselves to the unproven theory that CO2 causes temperature changes, and they have tried to explain how the tiny amount of CO2 contributed by humans (.03% of the CO2 in the atmosphere) can make the tiny amount of CO2 itself (3% of the atmosphere) change the weather. It sounds very unlikely, doesn’t it? It is clearly a political position, not a scientific one. What more likely explanation could there be for the Earth’s temperature cycles? We must go back to NASA’s own statement above on the direct correlation between the Sunspot count and periods of deep cold or warmth on Earth. A Meteorologist named Theodor Landscheidt (Died 2004) predicted today’s decline in Solar Activity back in 1989, and successfully predicted the weather trends that have accompanied it. His forecast is for an imminent coming period of decades where Earth’s weather will be very cold, caused by events similar to what was seen in the “Maunder Minimum” of the 1600’s. It is becoming more common to refer to today’s low Solar Activity period as the “Landscheidt Minimum”. 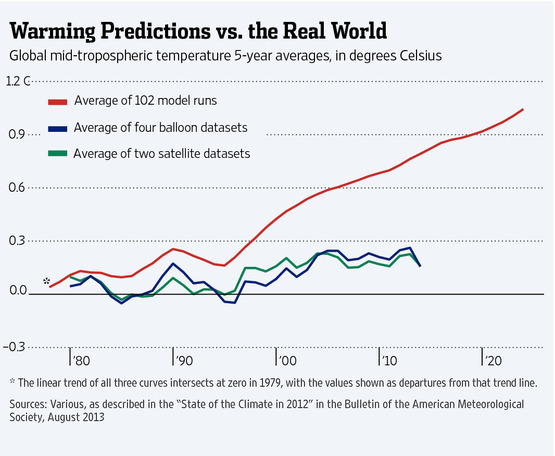 Per Landscheidt, Smith and Sharp, we are already tipping into a dramatic cooling period that will deepen rapidly, and be very obvious in the 2020’s or before. Here is a lin of tk to a page with Theodor Landsheidt’s papers. Note he successfully predicted recent El Nino and La Nina events. Here is a link to a page by Geoff Sharp on the late Carl Smith’s research on the effects of the Planets tugging on the Sun. Carl’s observations, going back 6,000 years describe the empirical connection between the orbiting movement of the Planets and the Solar Activity as measured by Sunspots. Building on Theodor Landsheidt’s work, Carl has demonstrated even greater accuracy than Landsheidt how the Sun’s activity may be explained and predicted. Geoff Sharp has contributed, standing on the strong shoulders of Landsheidt and Smith to refine and demonstrate further the direct empirical relationship between planetary movement and the Sun’s activity, and the Earth’s climate. What does this mean regarding the Earth’s weather in the future? If Theodor and Carl were right about the pattern of Solar activity we can expect in the near future, then Landscheidt’s prediction of a mini ice age in the first half of the 21st century will come true. There will be predictable effects on the Earth’s weather, including El Nino and La Nina ocean events and Global temperatures. We can expect dangerous, even deadly cooling in the next fifteen years with deeper cold and longer winters. The end will depend upon how fast the Sun recovers from the influences of the larger planets. Here is a link to a blog with discussions on this subject, giving credit to Theodor Landsheidt for his accurate predictions in the past. how temperature records were and are manipulated all over the world. The early half of the 1900’s were made to look colder while the last half of the 1900’s are made to look warmer, right into the 2000’s. Peaks of warming in the past were clipped off. Troughs of cooling were also clipped off, all to create a warming trend, to suppress the effects of ocean El Ninos and La Mina’s, and to enable new “Record” High temperatures today. So now we can see how claims are made today that new record warm temperatures are happening…. when they are not. We can also see how the long straight handle of the “Hockeystick” IPCC graphs are made from past S curves. Their models cannot even predict the PAST. Who can you trust if they change the actual Raw measurements in an obvious slant to match their story? Click on the links below to see how nearly all “Authorities” on temperature records have tilted or clipped their records to make warming that does not exist. Their patterns are obviously self-serving. One justification given for making “Homogenizing” adjustments is because some thermometers used started out in open areas, but paving and buildings were added nearby. They call this the “heat island” effect, because replacing soil and greenery with Manmade structures adds heat. However, this would only justify LOWERING recent measurements to compensate. What we observe is lowering earlier measurements and raising recent measurements. That is opposite of the “Heat Island”effect, so is plainly arbitrary change to support their Global Warming agenda. Notably, there has been such scrutiny of recent measurements that this “Fudging” no longer can be done. For current articles with more proof of misrepresentations of the raw measurements, go to my Twitter @paullitely to see more. A common technique today is to omit measurements of temperature and Ice and sea level, etc for the most recent years after 2012. Recent years trends have shown dramatic cooling Temperatures, and return of arctic ice to even above average. Severe warm weather weather event tornados and hurricanes have become much less common. This does not support the Global Warming agenda, so recent measurements are being delayed publication as long as possible. The truth is that the normal water cycle moves more heat around exponentially than ANY greenhouse gas. Water evaporating at the surface absorbs vast amount of Solar energy. Water condensing into clouds at altitude releases vast amounts of that stored energy and radiates it into space. Cloud tops also reflect 90% of solar infrared heating radiation back into space. 97% of Greenhouse Gas is water vapor itself. 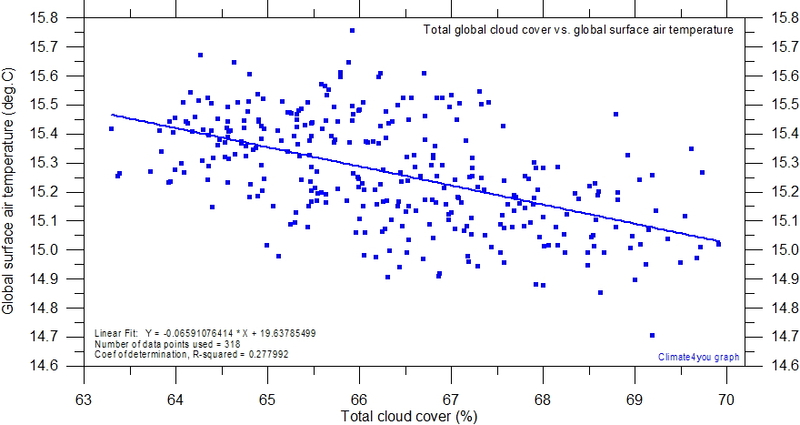 CO2 is at most .03% of the atmosphere, and 3% of greenhouse gasses. NOTHING can compete with water, working with the Sun, to govern the Earth’s temperature. The Sun is the only major source of heat. Clouds are the only major heat re-Radiator. Man cannot possibly control the Sun Or Clouds, so Man cannot Control the Weather. ManMade CO2 Globalwarming is a theory that has been disproven clearly as Forecasted Warming has failed over the last 18 years. No amount of excuses will explain it, only changing the theory can explain it. So where are the new formulas and computer models? Show me and I May agree. See considerthisinfo.com for the full picture. NOAA Releases New ADJUSTED Pause-Buster Global Surface Temperature Data and Immediately Claims Record-High Temps for May 2015 – UNBELIEVABLE! But The Ice Is Getting Thicker, Mr Shukman! It is very revealing they the amount of time over freezing 0 degrees Centigrade is declining. It is also colder than average. So how does the ice melt under those conditions? As part of their propaganda drive for Paris, the BBC’s “Science” Editor has taken a fossil fuel powered trip to the Arctic, to call in on a fossil fuel powered Norwegian scientific expedition, which is measuring and monitoring Arctic ice. The expedition ship has been escorted into the ice pack by an icebreaker, the KV Svalbard, which will no doubt help to break up the ice a little bit more! Changes in the Arctic Ocean are so profound that the region is entering what amounts to “a new era”, according to Norwegian scientists. A switch from a permanent cover of thick ice to a new state where thinner ice vanishes in the summer will have far-reaching implications, they say. The Norwegian Polar Institute has been mounting an expedition to the Arctic Ocean during the year’s coldest months. A bit on the long side, but stunning to say the least. Energy physicist Mike Brakey tells us why he is not surprised the NOAA might be investigated by Congress. (Sticky post). Last April, in a short, narrated YouTube series titled, Black Swan Climate Theory  (BSCT) irrefutable evidence was presented that sometime between 2011 and 2015 the National Oceanic and Atmospheric Administration (NOAA) had on two occasions rewritten its own version of Maine’s statewide climate history. The gist of my findings was that I believe I caught NOAA purposefully using computer code (algorithms ) to lower historic temperatures to promote present day temperatures as the warmest on record. The image above is from the new YouTube series posted after NOAA’s acknowledgement that they had indeed made improvements to Maine’s climate history. NOAA’s statement about the need to recently introduce colder Canadian data into Maine’s past climate history was highly fishy, to say the least. I decided to rework the research parameters to eliminate possible Canadian temperature infusion and confusion. Rather than compare my archived data for Lewiston/Auburn, Maine (Zone 19) to NOAA’s “statewide”  data for 32 Zones as I did in BSCT, I limited my analysis to NOAA’s southern interior data (CD 2) . 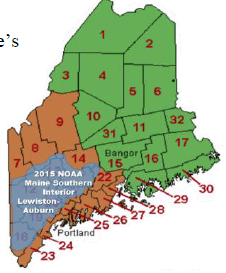 Since Lewiston/Auburn is centered in NOAA’s Maine southern interior climate region (see blue region of state chart), the two sets of numbers should essentially be identical. However, as I theorize, my findings again suggest NOAA is using a computer algorithm to inflate heating degree-days with all the raw climate data processed by an average of more than 10 percent. This new approach is documented on our new narrated PowerPoint series, Black Swan Climate Theory II  (BSCTII). It will be posted on YouTube by early June 2015. Here are some of the highlights of our findings. 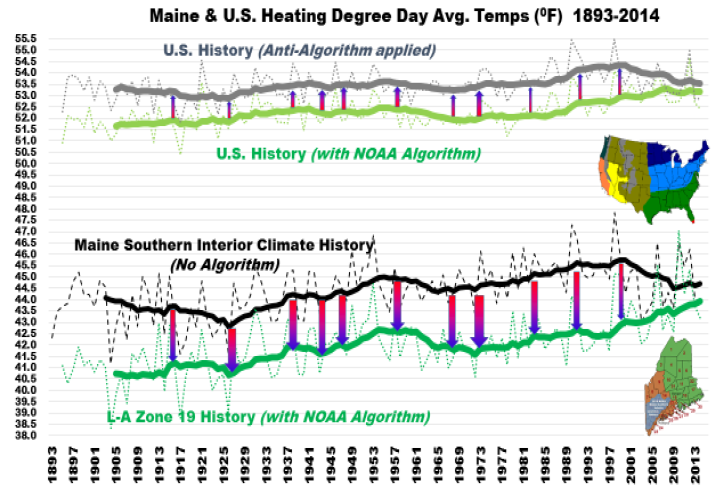 There remained an incredible discrepancy of Heating Degree Days (HDD) between the two southern interior Maine data sets. * 8,381 based on NOAA’s 2015 data for the southern interior region of Maine (105 HDD colder than statewide! See NOAA table below). I expected the HDD’s for the state’s entire 32 zones to be greater than for Lewiston/Auburn’s Zone 19 because the statewide NOAA data includes the vast colder regions in the northern part of the state. However, NOAA’s published 2015 data indicates the southern interior region of Maine runs 0.288°F colder on average over the last 119 years! This points out another of many flaws in the NOAA data when an agency begins relying on computer algorithms over basic clean data from Mother Nature. As I lay out my case in BSCTII, I contend that NOAA adjusted the data for all of Maine and for the southern interior region using the same algorithm shown in the first chart. NOAA’s HDD adjustments were kept small in the most recent decade then grew substantially in earlier decades of the 19th and 20th centuries. 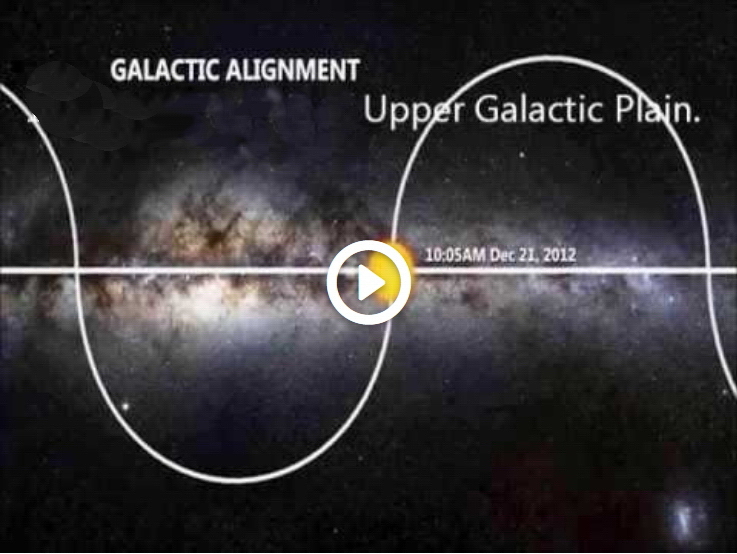 The chart above is drawn from BSCTII, Part 3 of 6, YouTube presentation . In the presentation, step-by-step, I compared the raw data for Lewiston/Auburn to NOAA’s data for the state of Maine. 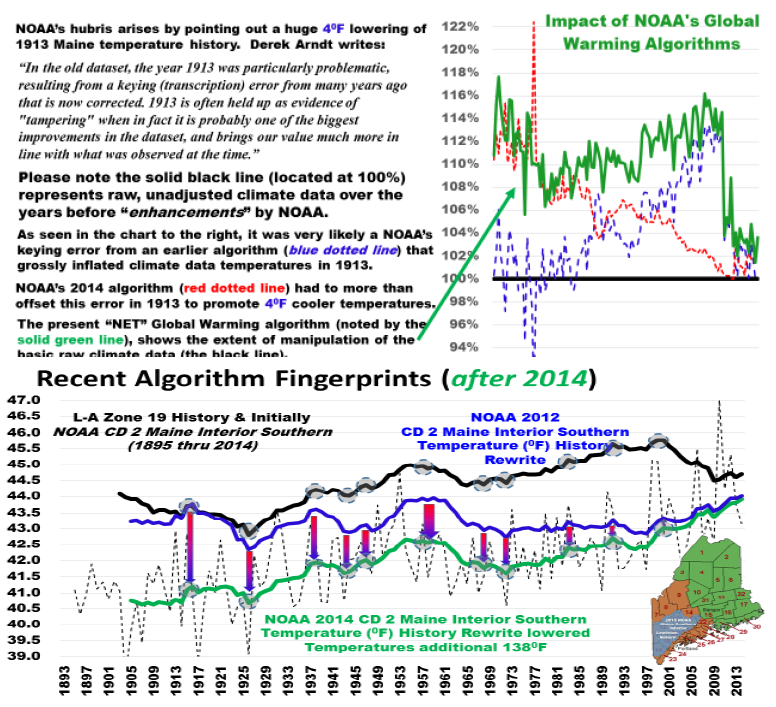 I was able to discern the two algorithms that I believe NOAA implemented in 2011 and in 2014. Mother Nature’s data is the solid black line in the chart. Deviations from Mother Nature is shown as the blue line (percentage adjustment detected in 2013 archived data); the red line shows the percentage adjustment made in 2014 (detected in 2015). The green line is the master algorithm, the net effect of the two adjustments (blue and red lines). I speculate that NOAA intended to quietly rewrite climate history over two programming runs (2011 and 2014). Each would lower historical temperatures a total of approximately 130°F. I speculate that computer programming errors were discovered internally by NOAA after the 2011 algorithm was launched. 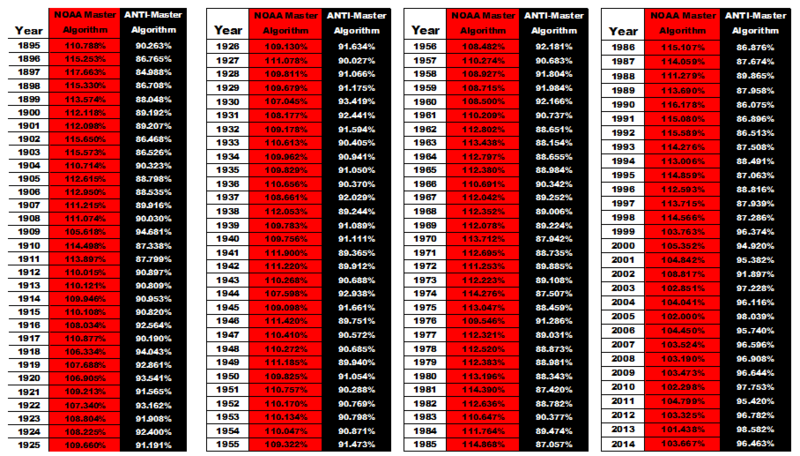 NOAA decreased the 1913 HDD by 10% as opposed to increasing it by that amount. NOAA made 1913 one of the hottest years in Maine’s history. They eventually corrected that error and others with their 2014 algorithm run. I was not the first to catch this major faux pas. Joseph D’Aleo, did a paper in 2014, involving Farmington, Maine data in southern interior Zone 13. The title of his effort was “Data Set Changes Makes It Hard to Tell Real Story” . He complained of a 5°F swing in 1913 for NOAA’s southern interior data. In my April study, I had detected a 4°F swing for 1913 based on statewide archived NOAA data. The 2011 algorithm lowered Maine “statewide” temperatures around 103°F. The Phase II algorithm run in 2014 corrected the 1913 error and lowered overall temperatures an additional 151°F. 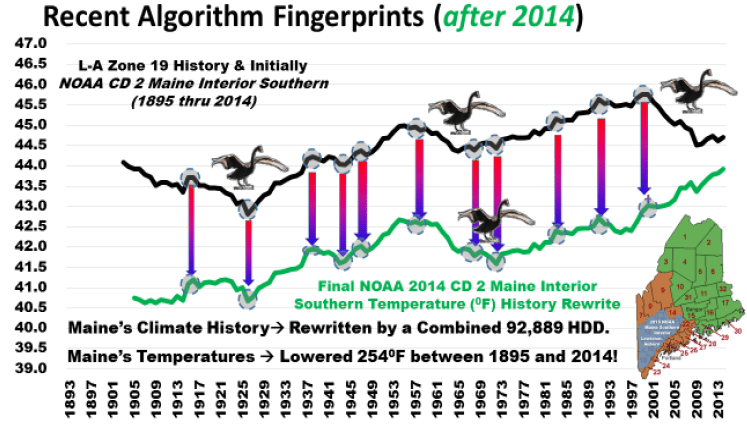 I contend that the master algorithm is now fully operational and maintains that Maine’s statewide climate history is over 254°F lower than the original documented records between 1895 and 2014! As detailed in BSCTII, I contend that NOAA has attempted to maintain a number of the climate “inflection points” for authenticity while minimizing or completely eliminating all but one cooling period between 1895 and 2014. Drawn from BSCTII, Part 5 of 6, YouTube presentation  the following chart shows originally three Black Swan events  found with the Lewiston-Auburn data (the black line) provided by Mother Nature. Three have been reduced to a single Black Swan event on the NOAA data (the green line) from 2014 for the southern interior region of Maine. Based on this and many other revelations found in BSCTII, I concluded that NOAA’s explanation of the inclusion of Canadian data was not only fishy—it proved to be a red herring . Based on these findings, my ongoing working theory is that NOAA continues to manipulate historic climate data through single master computer algorithm. The master algorithm array serves as the “trick” to hide present and future Black Swan  regional cooling events in Maine. I have also found that identical tweaks were being made with the other individual states and United State as a whole. It is being done by consistently lowering historical temperatures on all processed climate data controlled by NOAA as will be illustrated below with archived data from 2013. The graphs above illustrate how I contend NOAA applied a master algorithm “trick” not only to Maine, but to the United States as a whole. The green graphs show NOAA’s HDD published in 2013 for Maine and the U.S. The blue graphs show NOAA’s HDD published in 2015 for the same two locations. As you can see, the HDD have been inflated in both cases by the same percentages. In 2014, it appears NOAA had completed cooling both Maine and U.S. climate history by increasing HDD over 5%. This permitted NOAA to lower historical temperatures in excess of 10% between 1895 and 2014. Now NOAA and government agencies could announce to the world that 2014 was one of the warmest years in U.S. (revised) history. Another example includes NOAA’s data associated with Ohio. 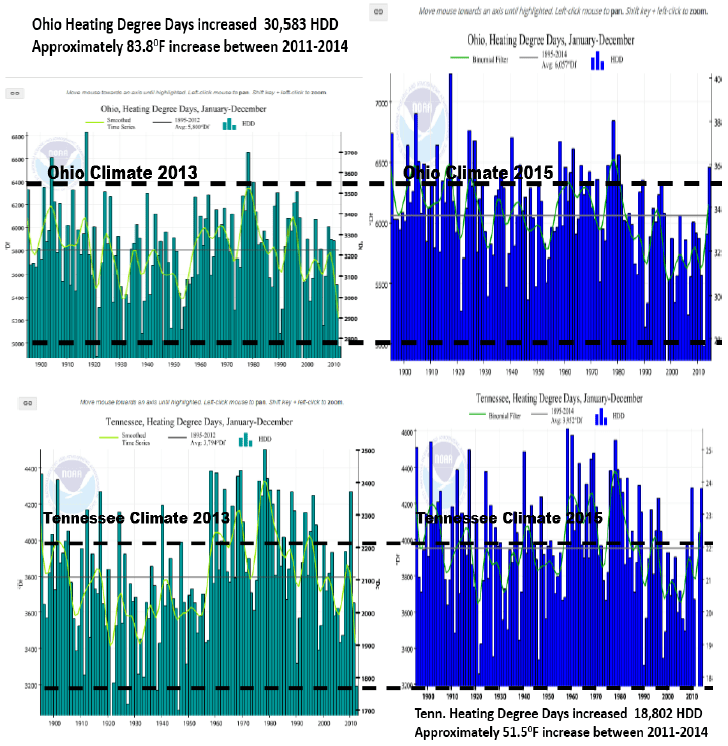 The green graph below shows NOAA’s data for Ohio prior to its 2014 adjustment (but after the 2011 adjustment). The blue shows the data after that adjustment. This second adjustment reduced Ohio’s historical temperatures by 83.8°F. You can see that it is the same pattern of adjustment as in Maine and the United States as a whole. I wonder if they needed Canadian meter stations here also! NOAA’s data associated with Tennessee increased 18,802 HDD between 2013 and 2014. This reduced Tennessee’s historical temperature record an additional 51.5°F. What is NOAA’s rational for the major correction here? The pattern is the same. Whosoever holds the algorithm for interpreting and documenting past climate history possess the power to shape a nation’s perception of present climate and the funding solutions. Are we experiencing global warming or global cooling? It depends on whose historical climate data we are examining! I want to emphasize again that NOAA admitted to massive rewrites of Maine “statewide” history on May 6, 2015. NOAA indicated all these changes to include Canadian stations were necessary to make sure the data truly reflected Maine history over the last 120 years. How do they explain similar adjustments to Maine’s southern interior region, Tennessee, Ohio and the United States as a whole? Every U.S. state for which I kept archived NOAA data had been corrupted in an identical manner. At this point in time, my theory that NOAA is rewriting U.S. climate history with a computer algorithm appears to still be valid. I contend that the NOAA computer program essentially uses a very simple algorithm array, that automatically takes each historical year of local data and “shapes it” to fit into an overall mosaic NOAA wants to project to the scientific community and the general public. The table below lists “Year”, “NOAA Master Algorithm Adjustment”, and the “Anti-Master Algorithm”. 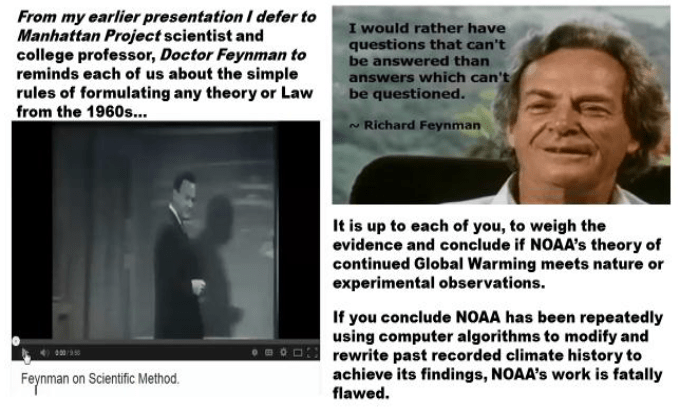 The Anti-Master algorithm is nothing more than the reciprocal of NOAA’s algorithm. This entire affair seems reminiscent of the early 1990s. The following chart below shows the multiple warming and cooling (Black Swan) periods over the last 1,100 years. In 1990, the United Nation’s Intergovernmental Panel on Climate Change (IPCC) published the graph seen in Chart 1. 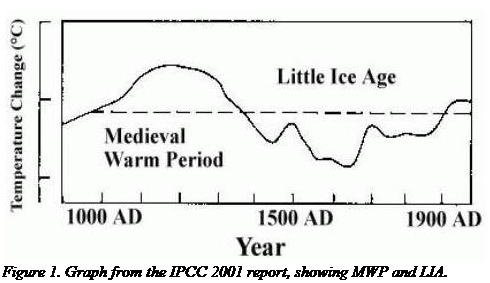 It showed that the Middle Ages were warmer than today, in what was called the “Medieval Warming Period”. Then, around the 14th century, society begins its descent into a series of “Black Swan” cooling climate events. We plunged into the “Little Ice Age” period from which we gradually emerged in the early 1700s. There were at least five major Black Swan events over this time period. 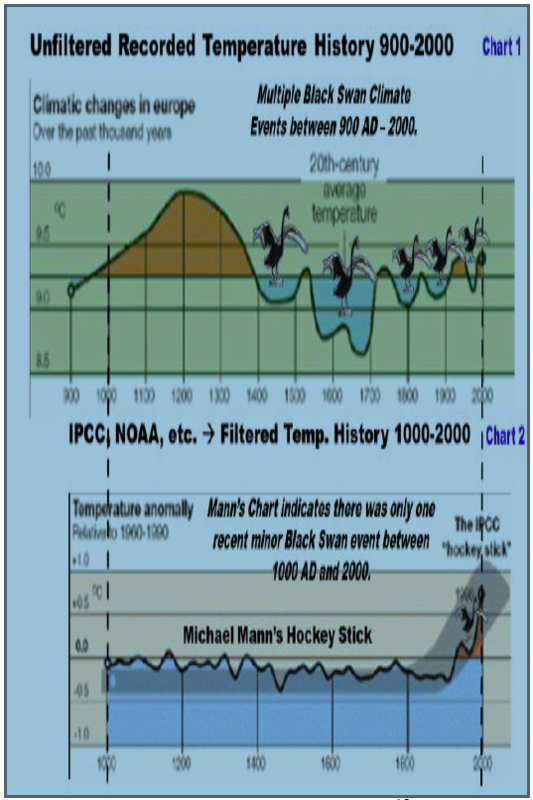 In the late 1990s Michael Mann published Chart 2 which redefined climate history and eliminated numerous Black Swan events. A Congressional investigation uncovered numerous errors in Mann’s chart and the IPCC dropped it from the Summary of Policymakers for its 2007 report. 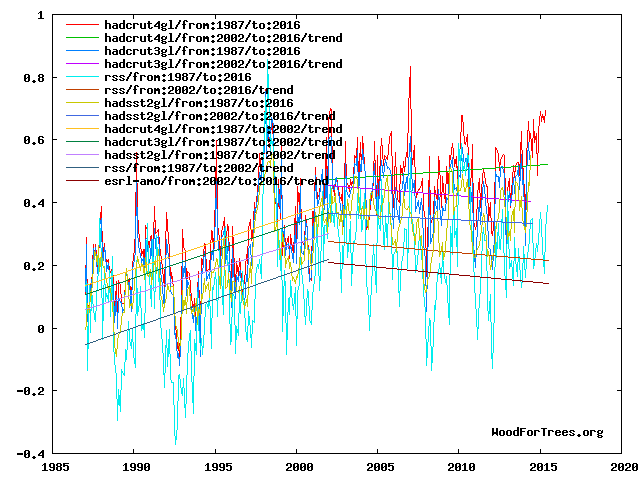 Unfortunately, the false hockey stick is still cited by advocates of the “science-is settled” position . This includes powerful members of NOAA and the current U.S. administration. Are we now remaking American climate history to adhere to Mann’s disappearing hockey stick? I have theorized that NOAA has possibly attempted a similar approach for inconvenient climate history in Maine and across the United States. The following chart shows the result of applying NOAA’s algorithm to the Lewiston-Auburn, Maine data (the black line). The result is NOAA’s green line. In the transformation you eliminate two of the three Black Swans. This chart thereafter falls in line with Michael Mann’s chart from the late 1990’s that cited only one Black Swan event in the last hundred years. 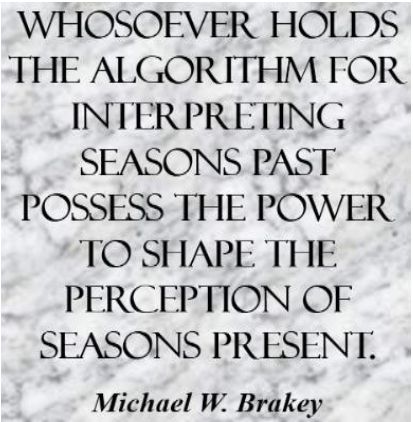 My theory is that, if you begin with NOAA’s “adjusted” data and apply the anti-algorithm, you return the “processed data” back to how Mother Nature provided us the information in the first place. As a last example, on the chart below, we will take NOAA’s “processed” data for the United States climate history and apply the “anti-algorithm array” (see table above). 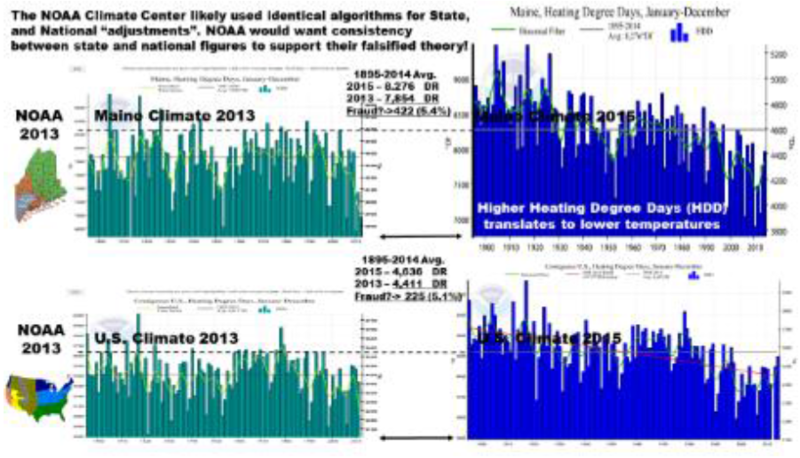 The application of the anti-algorithm would indicate the United States, as a whole, might have been in a state of regional cooling since the late 1990s, as is presently true of Maine when you use Mother Nature’s original data. As noted in BSCT and BSCTII, I play a short video clip of Doctor Feynman explaining how theories are generated and how they should be tested repeatedly. We expect no less here. I welcome a thorough examination of my algorithm theory. In Black Swan Climate Theory II we explain, in depth, why, in my opinion, I believe this is not an accident. I have concluded American basic climate data has been hijacked and corrupted within NOAA through the use of a simple master computer algorithm that I have repeated here. Based on the evidence from Maine, Ohio, Tennessee and consolidated U.S. climate data presented in the BSCT series; and should my theory be validated, the implications are profound. It would indicate we presently live in a nation where an agency of the Federal government has taken it upon themselves to rewrite the history of climate for the fifty different individual states of the Union. If my theory proves correct, billions of dollars of climate data has been corrupted within a formerly great organization. Worse, decisions worth trillions of dollars are being made presently on fraudulent climate data. As well-intended as I believe most NOAA associates are, I implore NOAA to please make available the plain, unexciting, unfiltered temperature data provided by Mother Nature. Throw the environmental activists  out! The litmus test for me is when NOAA’s climate data agrees with both satellite data and local archived data. A computer program can be viewed as an elaborate algorithm. In mathematics and computer science, an algorithm usually means a small procedure that solves a recurrent problem. I contend NOAA has been attempting to correct a climate aberration that Mother Nature has repeatedly thrown at the organization since 1998. These inconvenient aberrations are pockets of regional cooling in Maine, across the United States and likely around the world between 1998 and 2010! NOAA classifies Maine heating degree days under four divisions. They are Statewide CD 1 North CD 2 South Interior, and CD 3 Coastal. Unlike “statewide” and “CD 1 North” this region, “CD 2 South Interior” should have no reason to be subject to Canadian temperature contamination. 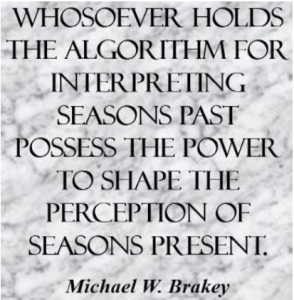 Black Swan Climate Theory II, Michael Brakey, June, 2015. The six part PowerPoint YouTube series is also found at the following link: https://www.youtube.com/playlist?list=PLDXMwo2SyaRse3GWujVHJGTLl9nvGAD59. 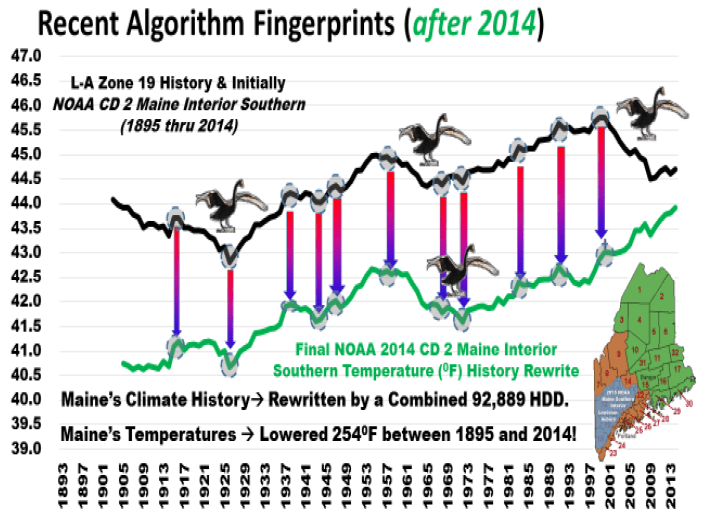 The presentation takes you step-by-step through how it appears that leadership in NOAA unashamedly created a new master algorithm that was applied to the Maine data to rewrite climate history. A Black Swan event is a significant cooling period of more than ten years. red herring is something that misleads or distracts from a relevant or important issue. It may be either a logical fallacy or a literary device that leads readers or audiences towards a false conclusion. or theory of black swan events is a metaphor that describes an event that comes as a surprise, has a major effect, and is often inappropriately rationalized after the fact with the benefit of hindsight. The Deniers, Lawrence Solomon, 2008, Richard Vigilante Books, Chapter 2, The Case of the Disappearing Hockey Stick. pp. 9-21. Robber Barons disparaging term dating back to the 12th century which refers to: 1. Unscrupulous feudal lords who amassed personal fortunes by using illegal and immoral business practices. 2. In social criticism and economic literature, became a derogatory term applied to some wealthy and powerful 19th-century American businessmen. Does it now apply to the leaders of the environmental movement? Mother Earth is a dynamic place, constantly changing and evolving. Although it operates in a cyclical manner, the major cycles are not short, falling into a time frame of thousands, tens of thousands, and hundreds of thousands of years. We know that the Sun rises in the east and sets in the west on a regular 24-hour cycle, but times vary depending on the season of the year. The Earth revolves around the Sun, and the Moon around the Earth, all in a cyclical predictable manner. These phenomena have always intrigued man leading him to seek more knowledge about his surroundings, about the star-filled skies, about his origin, about the future. There are NO Warming trends unless adjustments are the reason.